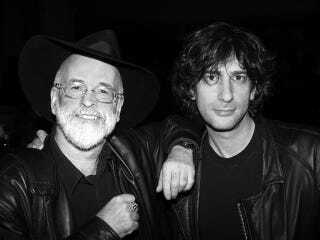 A while back, Neil Gaiman heard someone said of Terry Pratchett, "What a jolly old elf Sir Terry is." And that struck his long-time friend and sometime collaborator as absolutely wrong. So Gaiman took pen to paper to explain why. In The Guardian is an sxcerpt from Neil Gaiman's introduction to A Slip of the Keyboard: Collected Non-fiction by Terry Pratchett. It's a truly excellent account of Pratchett's anger and how it fuels his work. In doing so, he reminds us that being funny is rarely, if at all, related to being "jolly." The anger is always there, an engine that drives. By the time Terry learned he had a rare, early onset form of Alzheimer's, the targets of his fury changed: he was angry with his brain and his genetics and, more than these, furious at a country that would not permit him (or others in a similarly intolerable situation) to choose the manner and the time of their passing. Terry's authorial voice is always Terry's: genial, informed, sensible, drily amused. I suppose that, if you look quickly and are not paying attention, you might, perhaps, mistake it for jolly. But beneath any jollity there is a foundation of fury. Terry Pratchett is not one to go gentle into any night, good or otherwise. Terry Pratchett's Discworld novels are, to my mind, some of the best satire of our time. And of course turning keen insight into skewering writing would require a fuel of rage. If you're a reader of Discworld, this has become increasingly obvious in the novels. And, in Discworld, this anger finds itself personified in the form of Sam Vimes. There is an argument that Discworld didn't settle into its most recognizable form until Vimes, and his dark soul, came onto the scene. In a way, Discworld echoes Gaiman's point about Pratchett: Describing Discworld sounds purely whimsical, but it's hosted discussion about race, war, economics, gender, and everything in between. A need to illuminate the absurdities of these topics would require anger at their continued existence. It's the same anger that is so clear in stand-ups but seems harder to find when cloaked in fiction. What is included here is just a small part of what's at The Guardian, so definitely go read the whole thing.